Once you've got that university place confirmed though, you'll find that easy recipes for college students are just one of the things that will help ease the transition to independence. 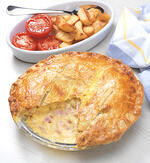 Here's a great one to share with your new mates at uni – it's all-day breakfast in a pie! Preheat the oven to 200˚C/400˚F/Gas Mark 6, 15 minutes before required. Cut the pastry in half. Roll out on a lightly floured surface and use one half to line a deep 20.5 cm/8 inch pie dish. Melt the butter in a small pan and sprinkle in the flour. Stir over a medium heat for 2 minutes, until thickened (it will form a slightly grainy paste). Draw off the heat and gradually stir in the warmed milk. Return to the heat, stirring constantly, until the mixture is thick enough to coat the back of a wooden spoon. Remove from the heat, add the bacon a little at a time, and stir. Season to taste and leave to cool. Beat the eggs and then stir them into the cooled sauce. Spoon the mixture into the pastry-lined dish. Roll the remaining pastry out to form a pie lid. Lightly brush the pastry on the edge of the dish with egg or cold water. Wrap the pastry lid around the rolling pin and place in position over the pie dish. Press the edges together firmly and trim. Make a decorative edge round the pie. Brush the top of the pie with beaten egg and cut slits across the top to allow the steam to escape. Place on a baking sheet and bake in the preheated oven. After 15 minutes, reduce the oven temperature to 180˚C/350˚F/Gas Mark 4. Brush the top of the pie again with the beaten egg. Continue to bake for a further 20–25 minutes until the pie is golden and the filling has set. Serve warm or cold with chips and baked tomatoes. Et voilà! Once cool, cover the top with clingfilm and keep in the fridge. I would not recommend freezing or reheating, but it will keep for 3–4 days in the fridge. It is good eaten cold – great to know it's in the fridge for peckish moments, night or day! This recipe is an extract from The Student's Cookbook (ISBN: 9781783612796), which is full of great advice and easy cheap recipes to help the new student get to grips with having to cook for themselves, on a minimum budget. Here are some super basic meal ideas for students at The Independent. Check out The Student Room, which contains helpful advice and forums on everything from revision and applying for uni, to health and relationships, finance and, of course, food! Chortle (or grimace) and these student kitchen reminiscences.